All accessories in salon quality: 3 ceramic coated round brush attachments – for every hair type, virtually all lengths and styles. Permanent ionisation: Allows fast drying without static charge. Keratin and argan oil enriched airflow: For shiny, knot-free hair. Dries and styles your hair in one go. Very easy to achieve perfect results as in a salon. 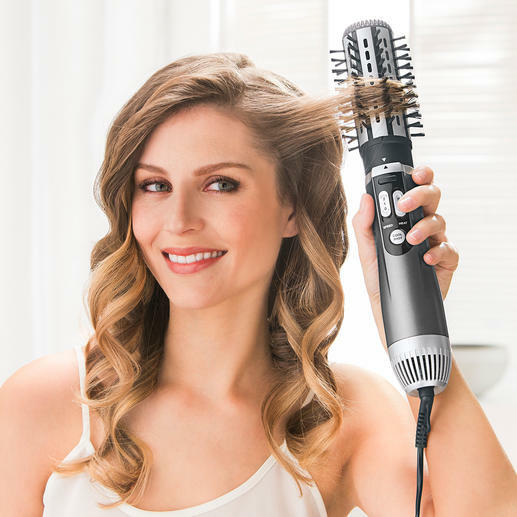 Forget the onerous task of styling your hair with a hair dryer and round brush. 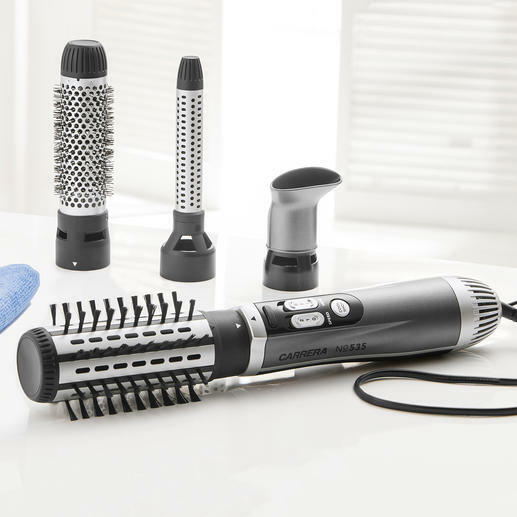 This ingenious hot air brush from CARRERA makes it much easier to get the perfect, professional look. Instead of only 400 – 800W – as is common – the device has a DC motor with an enormous 1,200W. Powerful enough to dry and style in one go. At the touch of a button, warm air is blown through the top to add volume and creates your choice of stay-put angel curls, medium curls or waves. The 300cm (9.8ft) cable (instead of often only 150 – 180cm (4.9ft – 5.9ft)) and the 360° cable joint ensure plenty of room to move without annoying cable twisting. With extra nozzle for pre-drying, 3 temperature and 2 fan settings and cold air for fixing. The negative ions split water droplets into micro fine droplets, prevent the hair from positively charging and smooth the outermost cuticle layer. Before curing, the ceramic coating is enriched with keratins (fibre proteins) and argan oil. The nourishing molecules are transferred to the hair with the airflow and add shine and elasticity. Made of ABS plastic with soft-touch handle. Incl. brush attachment approx. 40cm (15.7") long. Weight: Approx. 700g (24.7 oz). Connection for 220-240V/1,200W. TÜV Süd/GS certified safety*. Professional accessories for all lengths and styles included. Round brush attachment 22mm (0.9") in diameter: For stay-put angelic curls and lots of airy volume for short hair and fringes. Thanks to retractable bristles it can be removed from your hair without tangling. Round brush attachment 38mm (1.5") in diameter: For long-lasting XL volume for medium-length hair and even curls of medium size. Round brush attachment 50mm (2") in diameter: For structured volume even with long hair and rich, full-bodied waves. Styling nozzle: For quick drying and pre-drying, especially for long and medium-length hair. “Thanks to this brush you can forget about your hair dryer”.